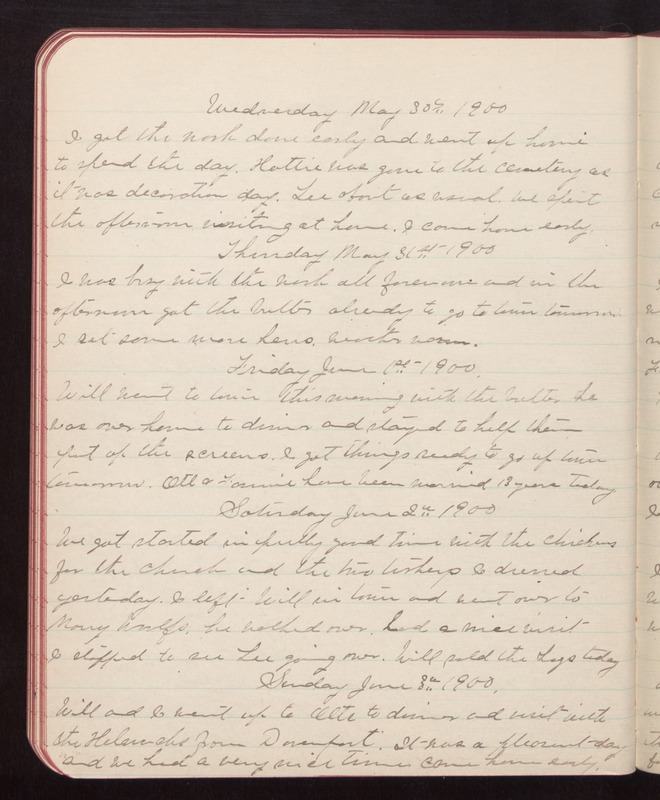 Wednesday May 30th 1900 I got the work done early and went up home to spend the day. Hattie was gone to the cemetery as it was decoration day. Lee about as usual. We spent the afternoon visiting at home. I came home early. Thursday May 31st 1900 I was busy with the work all forenoon and in the afternoon got the butter already to go to town tomorrow I set some more hens. Weather warm. Friday June 1st 1900 Will went to town this morning with the butter he was over home to dinner and stayed to help them put up the screens. I got things ready to go up town tomorrow. Ott & Fannie have been married 13 years today. Saturday June 2nd 1900 We got started in pretty good time with the chickens for the church and the two turkeys I dressed yesterday. I left Will in town and went over to Mary Woolfs, he walked over. had a nice visit I stopped to see Lee going over. Will sold the hogs today Sunday June 3rd 1900. Will and I went up to Otts to dinner and visit with the [Helnichs?] from Davenport. It was a pleasant day and we had a very nice time. Came home early.